Sends 3G HD Video, Audio, Camera Control and Power Up to 2,000 Feet! Or Virtually unlimited distances with battery or local camera power! CLICK PLAY TO SEE VIDEO! PTZ-CL2000P - With Camera Power! Sends 3G HD-SDI video, audio, camera control, and POWER up to 2,000 feet via TFS hybrid fiber cable. PTZ-CL2000 - All features of PTZ-CL2000P except hybrid cable power but distance is virtually unlimited using TFS dry fiber cable! Requires AC/DC supply (included) or optional battery pack for DC camera power. * 3G HD-SDI video, audio, and camera control using virtually unlimited lengths of TFS Magnum "Dry" non-powered tactical fiber cable. * Local power for camera module & camera required using included AC/DC supply or optional battery pak. PTZ CamLink2000P with Camera Power via Hybrid Cable Up to 2,000 Feet! 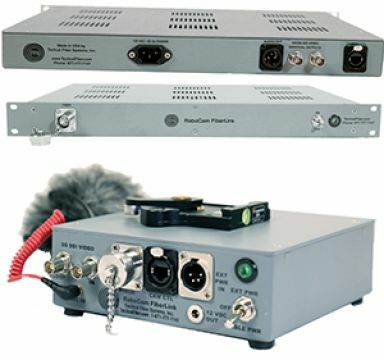 * 3G HD-SDI video, audio, and camera control and POWER up to 2,000 feet over TFS Magnum HYBRID tactical cable.